Over the past 6 months or so I’ve come across countless blog posts about Oliver + S patterns. I wanted to see what the fuss was all about and so I went to their website and immediately fell in love. Although their patterns are pretty pricey, I decided to treat myself to two of my favorites as a gift for Christmas–the Family Reunion Dress and the Ice Cream Dress. Since I was definitely not sewing much at the time due to holiday travels and third trimester tiredness mixed with an energetic toddler, it took me awhile to get sewing. I started with the Family Reunion Dress, which I absolutely adore! There is so much attention to detail in Oliver + S patterns that I decided to take my time and just do a few steps each night. I started the dress while I was still pregnant in hopes that it would be an 18 month picture dress for Hannah but I got busy getting ready for the baby and so I didn’t end up finishing it until well after Katie was born and 18 months had come and gone. Oh well! I finally finished it a couple of weeks ago and I’m glad I did because it turned out to be my very favorite dress that I’ve ever made. And that is how my current Oliver + S pattern obsession began. So after going on and on to my poor husband about how much I love Oliver + S patterns and how excited I am to have two more (I spent some of my birthday money (thank you in-laws!) on two more), I decided to dedicate an entire month to sewing only Oliver + S patterns! Hopefully this will keep me inspired to post regularly again…fingers crossed. 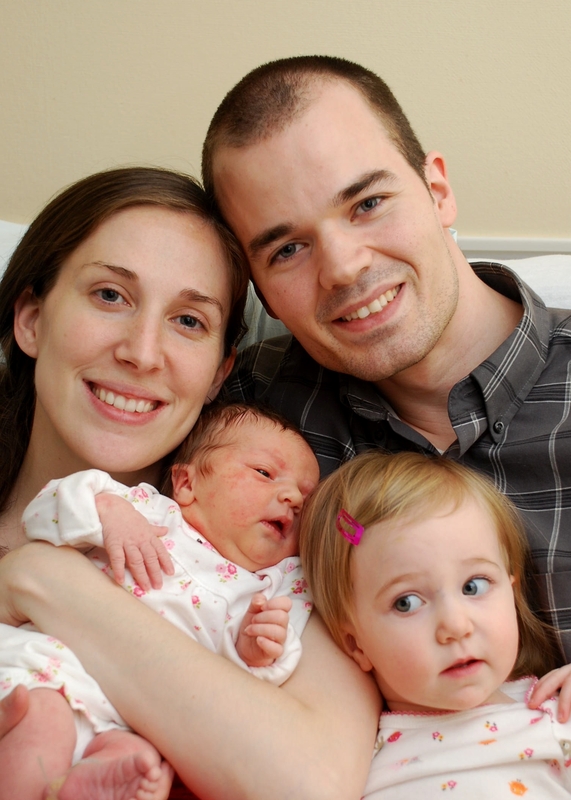 On March 11th, we welcomed our beautiful little Katie into the world. 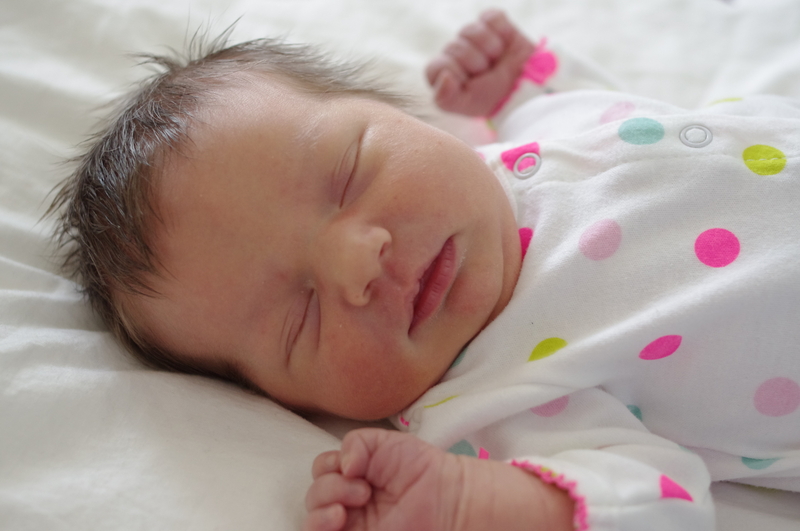 She has been such a dream baby and I’ve enjoyed every minute since she arrived! 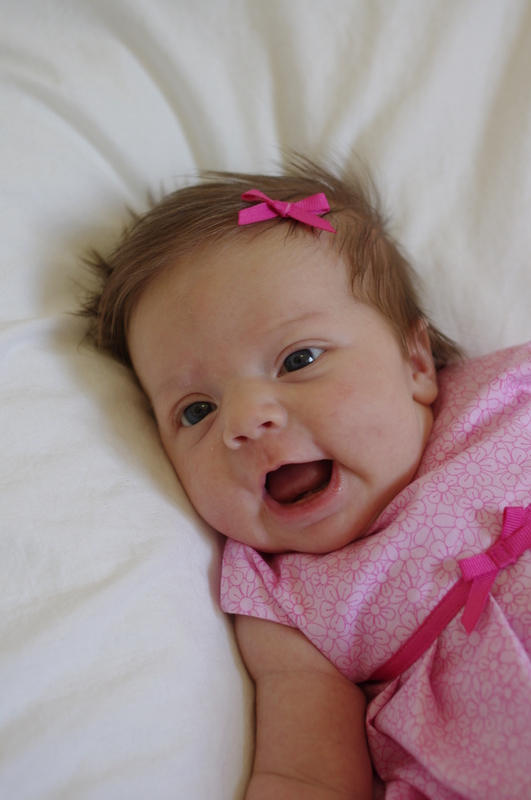 I can’t believe that she is already 7 weeks old today. My biggest worry was how the adjustment would be for Hannah. After all, it is a big change to go from almost two years of uninterrupted mommy time to suddenly having to share mommy with a newborn who needs to be fed, changed, and held round the clock. 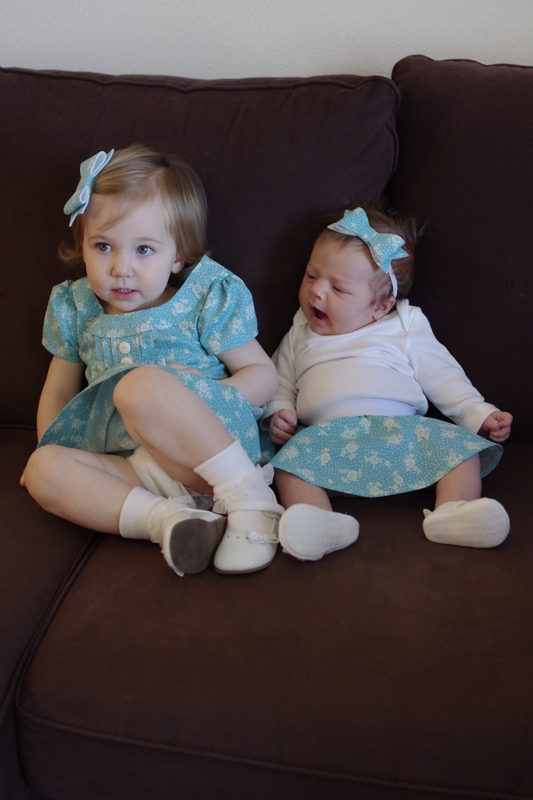 But Hannah has been an amazing big sister and absolutely loves little Katie. It’s been such a smooth transition that I’ve actually started to sew again! 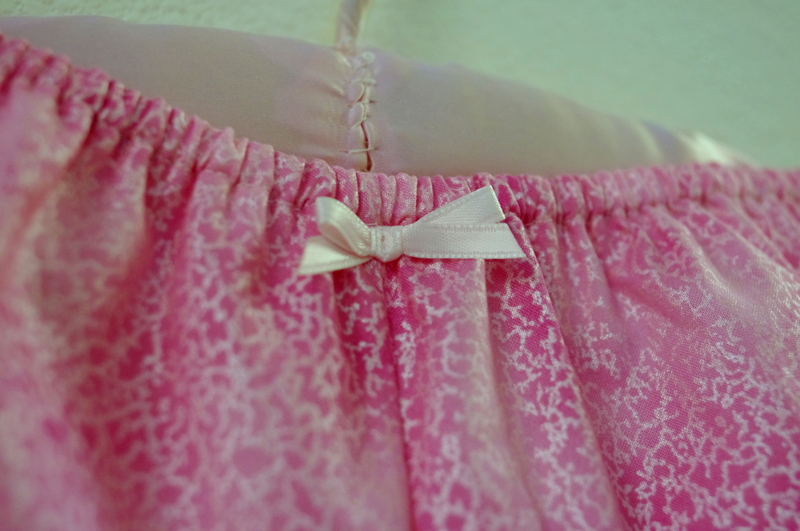 Throughout the later part of my pregnancy I was just too tired and unmotivated to sew most of the time, and when I had the energy and the desire to sew, I was too lazy to take pictures and write up a post. 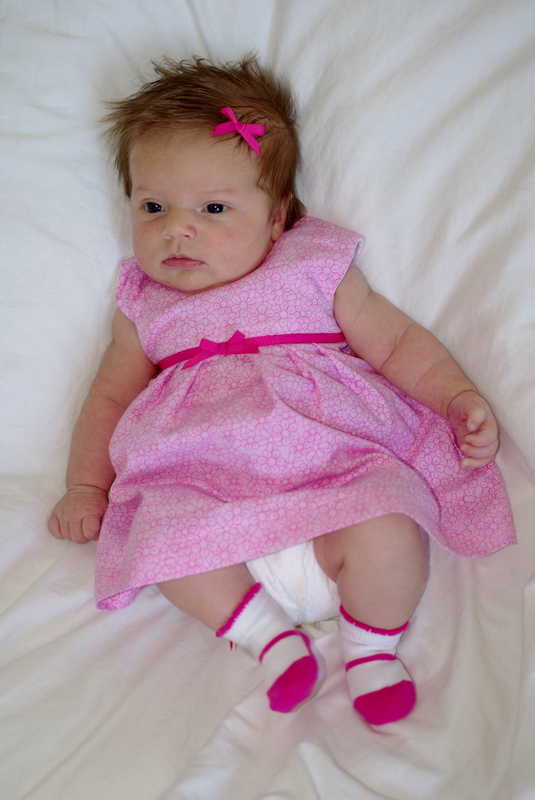 This dress was the first outfit that I sewed for Katie. 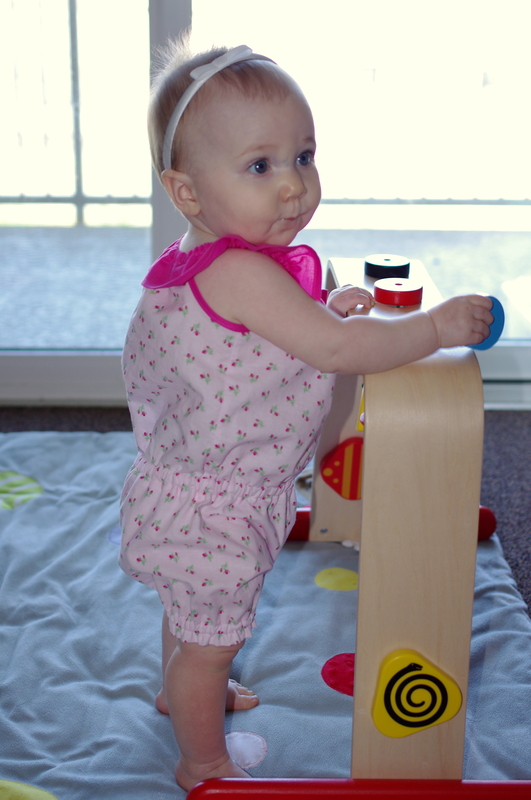 I used the Geranium Dress pattern from the blog Made By Rae. It was so much fun to work on this dress (one of the best patterns I have ever used!) not long before she arrived and to think about what it would look like on her. Thankfully I did get this dress sewn up before she arrived, otherwise I’m not sure what she would have worn for her one month pictures! I can’t believe that my sweet little Hannah is turning one next month! Since her birthday is fast approaching, I’ve been slowly but surely working on the party planning. And one of the most important things to me is the dress! 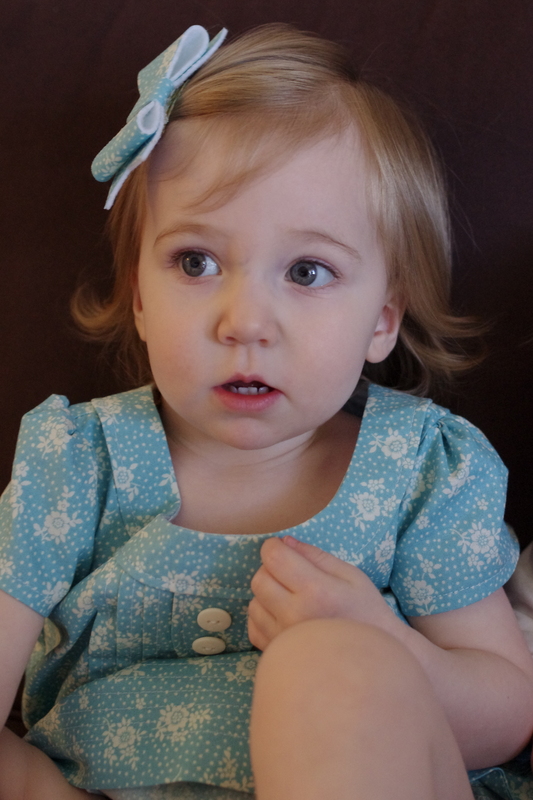 As soon as I came across the Piper’s Stripwork Maxi Dress pattern, I knew that it was perfect for Hannah’s first birthday. 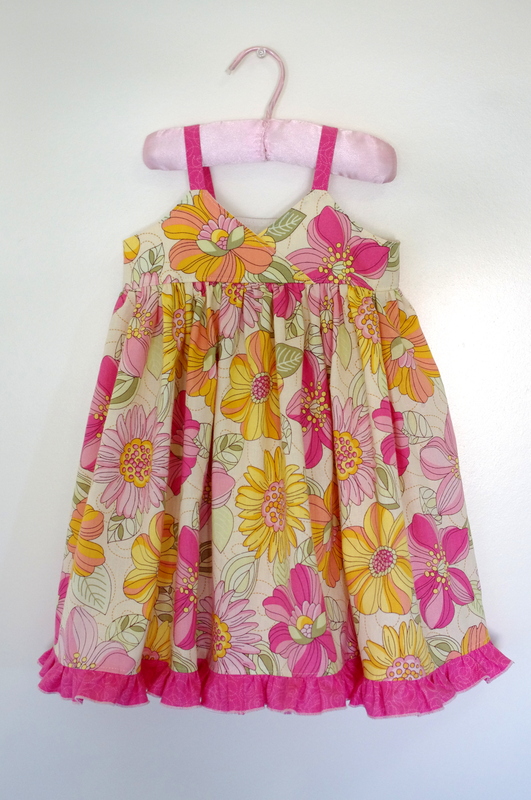 And lucky for me, I won the pattern—and two others—in a giveaway on the Create Kid’s Couture blog! So exciting!!!! The pattern directions were very clear and easy to follow and the dress turned out amazingly well. I am absolutely in love with this dress! 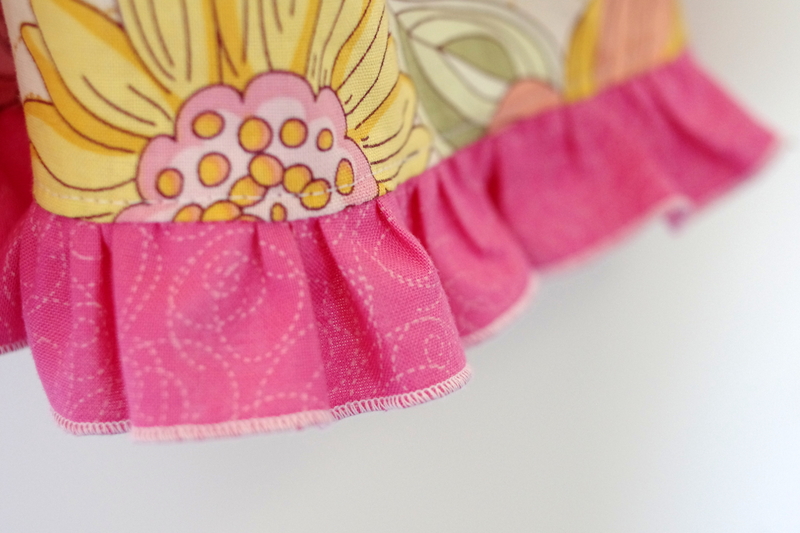 A really great thing about this pattern is that it includes sizes 6-12 month through size 8. I will definitely be using this pattern many more times in the years to come! The big difference between the dress I made and the pattern is that I didn’t use 7 coordinating fabrics to create the stripwork effect on the skirt portion of the dress. 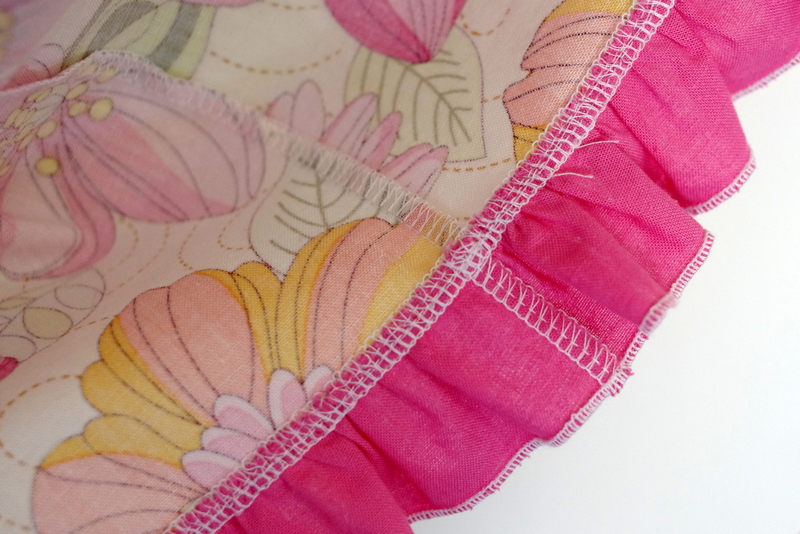 I love that look but I really wanted to showcase the beautiful flowers on this fabric. The most time consuming and challening part of this dress for me was figuring out how to do a rolled hem on my serger for the first time. I tried many different settings but couldn’t get it quite right, so I took to google and found a wonderful mini tutorial that was a real life saver. Now I’m super excited to try rolled hems again. Anything to avoid measuring and ironing hems whenever possible! Speaking of my AMAZING serger, I can’t help but admire the beauty that is a serged seam on the inside of a homemade garment. So much better than zig-zagging! Thanks again to my husband for getting me such a great birthday present!!!! A friend of mine from church has a cutie pie four year old who loves to wear dresses pretty much everyday but she is not exactly the dainty type. She loves to dig in the dirt and look for every kind of bug she can find. She loves to run and climb. Basically, all the things that you don’t usually do in a dress. 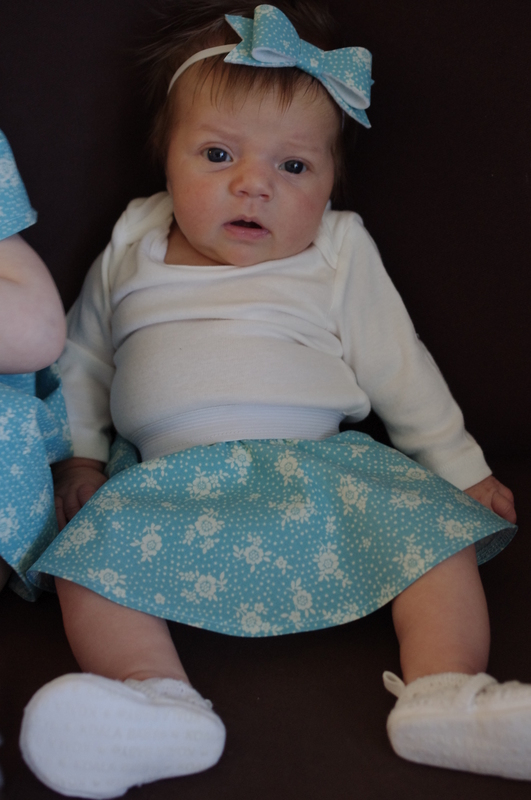 Because she’s super active and on the go but insists on wearing dresses, her mom insists on bloomers. And it’s a win win since they’re practical and adorable at the same time! Since this active little girl has only a few pairs of bloomers and her poor mama is constantly having to wash them, my friend asked if I could whip up a few pairs of bloomers. Since the little one loves the boyshort variety and I didn’t have a pattern that would work for that style or her size, I went in search of a good pattern at the Joann’s $1 Simplicity pattern sale where I found the perfect pattern—2461. The pattern is actually for shorts, so when I traced the pattern onto regular paper I simply took off a few inches from the length so that they would be roughly the right length for more of a boyshort fit. 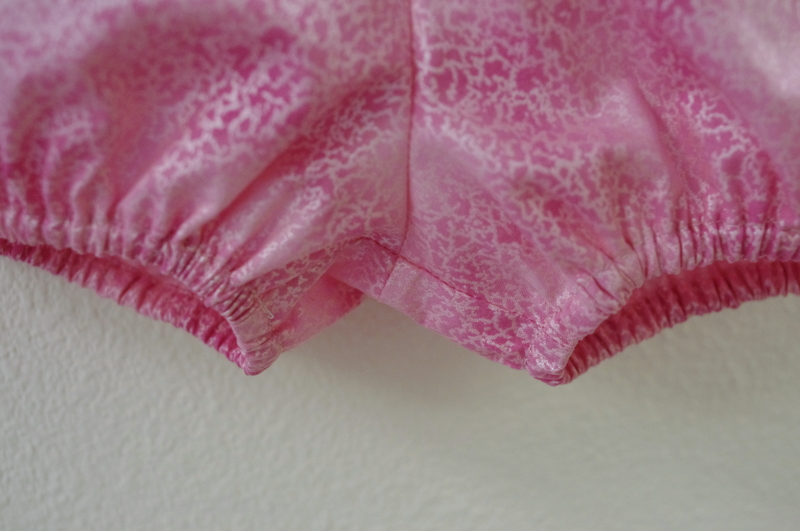 The pattern calls for 1/4″ elastic, which is perfect for comfy fitting bloomers, so I didn’t have to make any adjustments to the pattern aside from length. Because I don’t have any custom tags or anything fancy like that, I decided a little bow in front would be a good way for the little one to easily tell front from back and would double as a cute embellisment. Such an easy project! 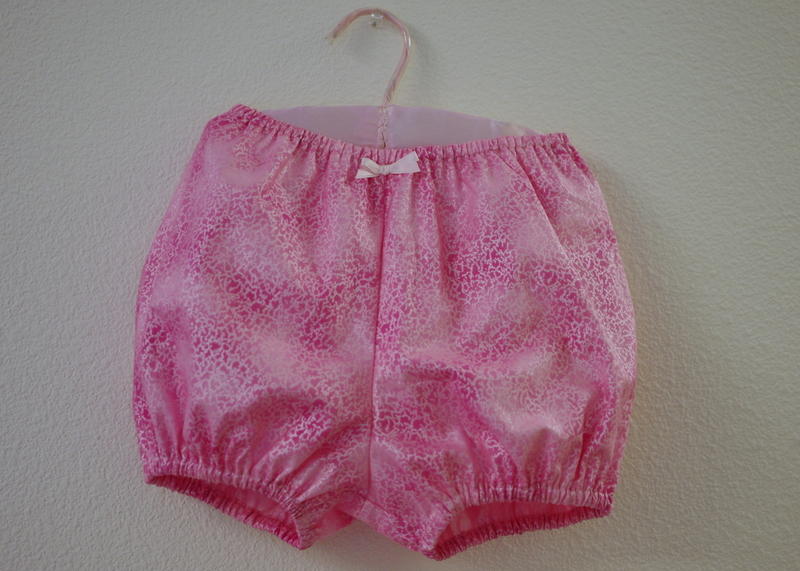 These bloomers are the first of a few pairs that I plan to make. 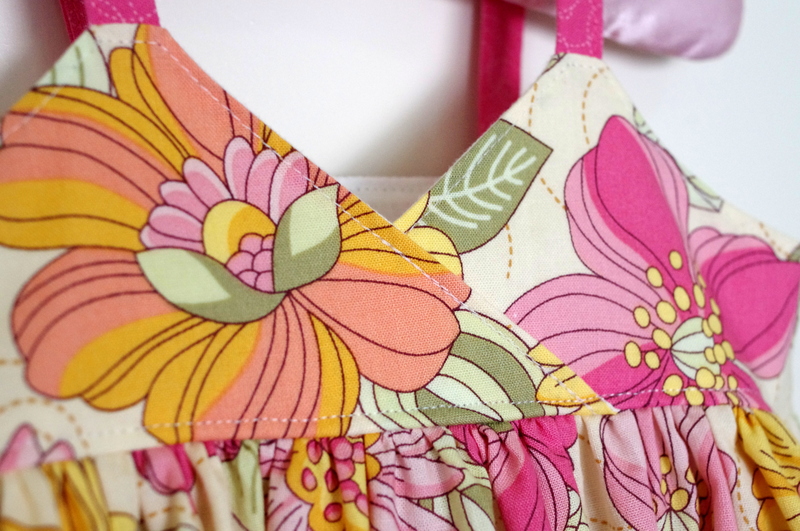 While perusing sewing patterns on Etsy, I came across the Peek-a-Boo Pattern Shop. There are so many adorable patterns to choose from–dresses, skirts, rompers, hats, shoes, swimsuits….you name it! But as soon as I saw the Gracie Romper, I knew I absolutely had to have it. Especially since it was only $6.50 for eleven sizes! A real bargain if you ask me. I made the twelve month size for Hannah who is just over nine months. It seems to fit really well and it came together fairly easily. I’m definitely going to crank out a few more of these rompers. They are so much more practical than dresses and skirts at this point since Hannah is still crawling. 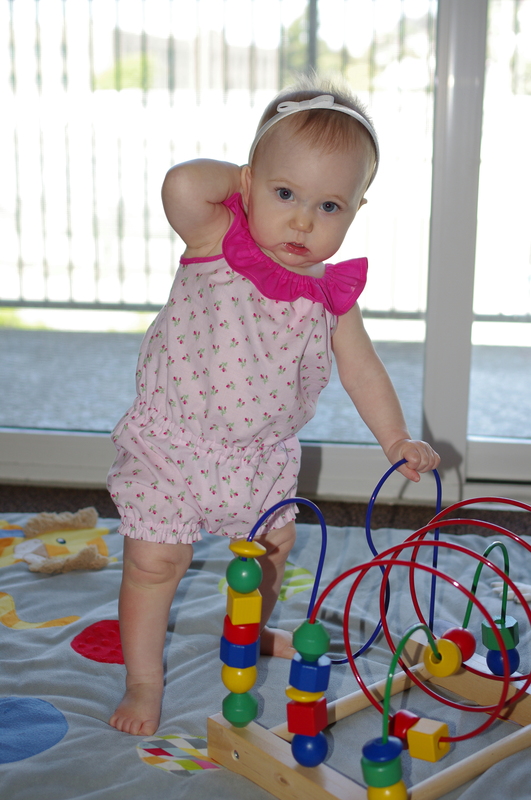 Although she can crawl on hands and knees, she prefers to scoot with one leg and craw with the other, sort of a scoot/crawl hybrid. When wearing dresses and skirts she get all tangled up and frustrated. So I’m thinking this will be a summer of rompers. PS: Keeping the headband on is a challenge these days. I’m sure you noticed her trying to yank it off in the pictures above. She loves to chew everything, but especially her headband. Sheesh! Now that Hannah has outgrown pretty much all of her pajamas, she desperately needs something to wear to bed. To try out a new pants pattern I have, I decided to whip up some quick jammie pants (as I’ve been calling them) out of some snuggle flannel that I had on hand. The pattern I used was from the book Amy Butler’s Little Stitches for Little Ones. Because I love using patterns where the pant legs are one piece, I modified the pants pattern from the Kimono-Style PJs project. After cutting off the 1/2” seam allowances from the outside seam of both the front and back leg patterns, I taped the front and back pieces of her pattern together on the outside leg seam. I also lengthened the legs. 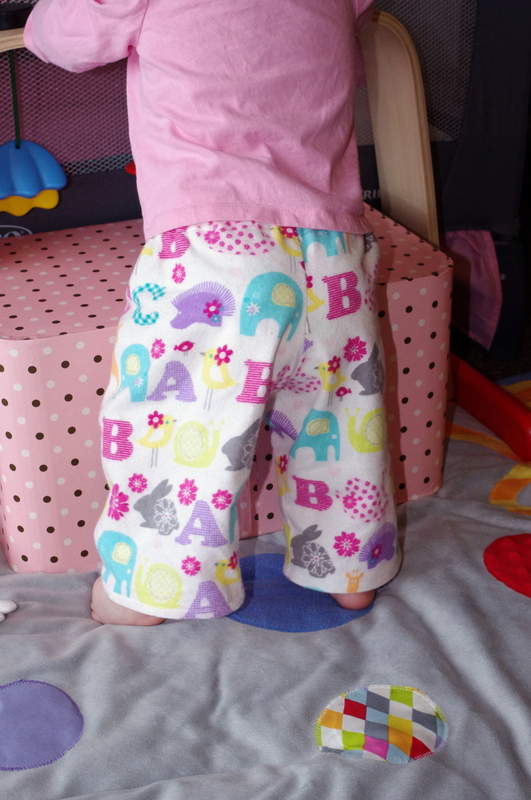 Her pattern calls for a coordinating fabric for trim, but I didn’t want to get that fancy for jammie pants, at least this go-round. Something I learned on this project: when using one piece patterns for pant legs, you must cut one leg with your pattern on the right side of the fabric and one with your pattern on the wrong side. If you don’t, you’ll end up with two right legs or two left legs. I did that and figured it out when I went to pin the two legs together to sew the crotch seam and they didn’t line up at the waist. 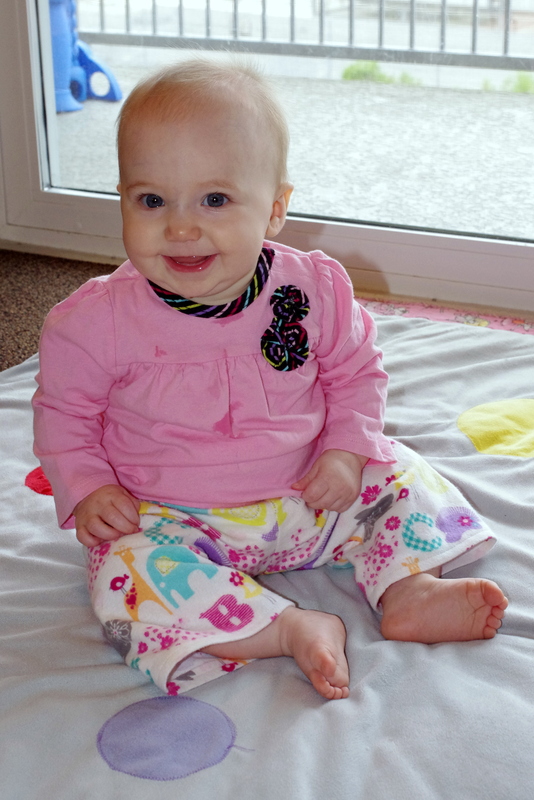 Luckily I had enough fabric to cut the other legs out, so Hannah will have two pairs of jammie pants in this fabric. Today I went to Joann Fabrics with my little one to check out the pattern sale. 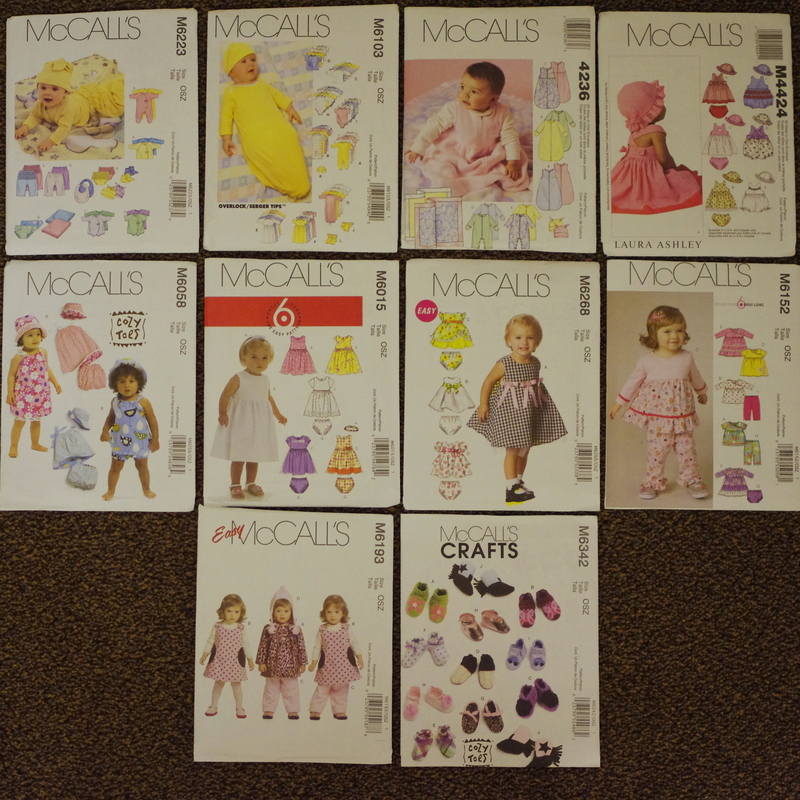 I couldn’t believe that the McCall’s patterns were only 99 cents! I wasn’t sure what I’d find but I feel like I discovered a goldmine. The funny thing is that I’ve never looked for patterns before. I thought that they’d all be on racks along the wall. As I approached the patterns area, I realized that I was mistaken. Then I saw some ladies sitting at a table looking at these giant books and so I followed their lead. First you have to find the pattern in a book and then get the ones you want from the humongous filing cabinets close by. After discovering the proper way to find a pattern, I looked quickly while juggling my daughter in one arm, bouncing her to keep her occupied, and finding patterns with the other arm. When all was said and done, I walked away with 10 patterns for a grand total of $10.82. The patterns were regularly priced between $11.95 and $18.95. I definitely count this shopping trip a success.